Elbrook Cash & Carry - the Mitcham based Cash & Carry operator and owner of CHAK89 the Conference, Banqueting & Restaurant facility – last week hosted their second Annual Charity Ball at their stunning venue CHAK89. The event was held in association with Paul Strank Roofing – a successful Wimbledon company with a long history of charitable work. Fukhera Khalid started Elbrook Cash & Carry 26 Years ago as a 16 Year Old and has built it into one of the best single unit Wholesalers in the UK – a member of the Grocer Top 30 Elite Wholesalers. Fukhera is also one of the Top 100 most Influential Asian Businessmen in the UK. The Khalid Family welcomed over 300 guests to their evening which included representation from the House of Lords , House of Commons, Leading Asian Businessmen , Celebrities from Film and Television, Footballers, Sky Sports News Presenters, Leading Personnel from Today’s Wholesale, the Major Brewers, Major figures from the Trade Press Elbrook’s leading suppliers and a whole host of family & friends. Superb Food & Refreshment was supplemented by high quality entertainment from Stavros Flatley, Millie May, Lemar & Beverley Knight. The Auction on the evening raised in excess of £18,000 and those funds added to supplier sponsorships and ticket sales , meant that Elbrook Cash & Carry were able to raise £36,000 on the evening which will be split equally between 2 Local Charities – the Shooting Star Children’s Hospice Charity and the One Life Charity. 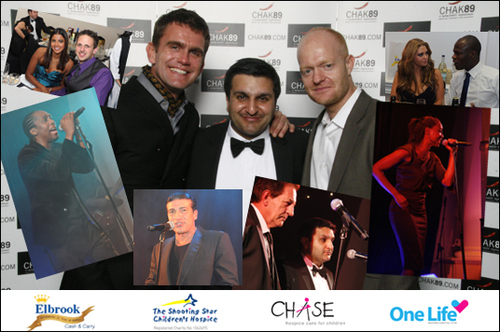 The Photograph shows Fukhera with the Eastenders brothers plus shots of Lemar and Beverley Knight performing. Other guests included Pooja Shah, Tamer Hassan and Bianca Gascoigne. Elbrook Cash and Carry was founded in September 1984 opening its first premises in Stratford, London. It later moved to premises in Barking, Essex where they started selling alcohol, confectionery, soft drinks, wines and cigarettes. From 1986, Elbrook Cash and Carry grew to such a position that on 22 November 1993 they opened a new branch in Mitcham, which was a resounding success. Elbrook Cash and Carry has become one of the leading cash and carry's in London to date. Chak89 are not only a top Indian restaurant in London, but are also perfect for all types of wedding celebrations and a great Indian wedding venue, they can accommodate and cater for up to 650 guests in two adjoining banquet halls. They are also perfect for business conferences, or can bring the CHAK89 experience to you by allowing their Indian caterers to stage your special day at any venue of your choice. This press release was distributed by ResponseSource Press Release Wire on behalf of Chak89 in the following categories: Entertainment & Arts, Business & Finance, Media & Marketing, for more information visit https://pressreleasewire.responsesource.com/about.